Julian Assange ought to be called the four billion dollar man. $4.2 billion dollars in loans from the International Monetary Fund were approved for Ecuador within hours of that country's withdrawal of Australian born Assange's asylum claim and citizenship. That betrayal yesterday, April 11th in the early morning hours, was followed by Ecuador permitting UK police into their London Embassy offices where Assange has been a virtual prisoner for the past seven years. He was publicly dragged away to face bail jumping charges in the UK and an immediate set of hearings on his extradition to the United States. There is one unsealed indictment circulating and another sealed one waiting in the wings along with a third older sealed indictment and a lawsuit by the Democratic Party. Schummer has revealed quite a bit with those few characters both about his desires and a lack of comprehension of the law. The only unsealed indictment against Assange (which is provided for the reader to download and read at the bottom of this article) does not use either the word election or the word Russia a single time. All the accusations relate to the releases by Wikileaks now referred to as the Iraq War files and the State Department Cables. On March 8th, Chelsea Manning was jailed for refusing to testify against Assange and Wikileaks before a grand jury in Virginia. She has already served time in the military prison system for releasing evidence of American war crimes through Wikileaks, including the deliberate murder of children and Reuters reporters from an Apache helicopter on the streets of Baghdad. Anything she could say on the witness stand has already been said at her 2013 court martial. The first thing to note is that Chelsea Manning was jailed for not testifying AFTER the indictment had already been filed. Her jailing for contempt can not be any longer than the sitting of the grand jury. After a grand jury returns it's findings as indictment it court is over. Thus either a) Manning was jailed illegally to force her testimony to a court that no longer exists or b) there is another case. So, if Chelsea Manning was jailed for a no longer existing case there are two indictments. If she is jailed for a grand jury that still sits that means there are three. Further, the Stratfor hack, which sent both Barrett Brown and Jeremy Hammond to prison, contained an email that stated there was a sealed indictment for Assange as far back as 2010 "Text Not for Pub. We have a sealed indictment on Assange. Pls protect." Altogether that is four indictments. Further, there is the lawsuit by the Democratic National Committee, claiming that publication of there emails constitutes “economic espionage” on their “trade secrets”, like efforts to carry out voter suppression and to promote Donald Trump so that Hillary Clinton would not have to run against a Republican moderate who had policies so much like her own. That allegation can be seen in print below. Thus the DNC's civil suit is purely punitive and sets the stage for a follow up criminal trial based on evidence that would be coerced through jailing. We are not at a sum total of at least two court cases in the United States and possibly as many as six. 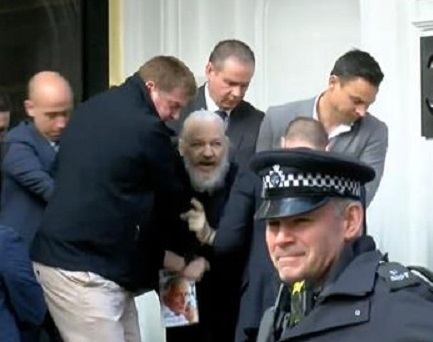 The idea is to have Assange endlessly on trial, endlessly berated, endlessly humiliated before he is endlessly imprisoned, just as they are doing as Chelsea Manning. Taken together the whole operation is a terror tactic against the actual profession of journalism as well as a warning to anyone who thinks of exposing human rights abuses or war crimes that the rest of their lives will be spent in trial, on suicide watch or in solitary confinement.